Riley watches her hero up close. Riley up on the Zamboni, preparing for her ride. 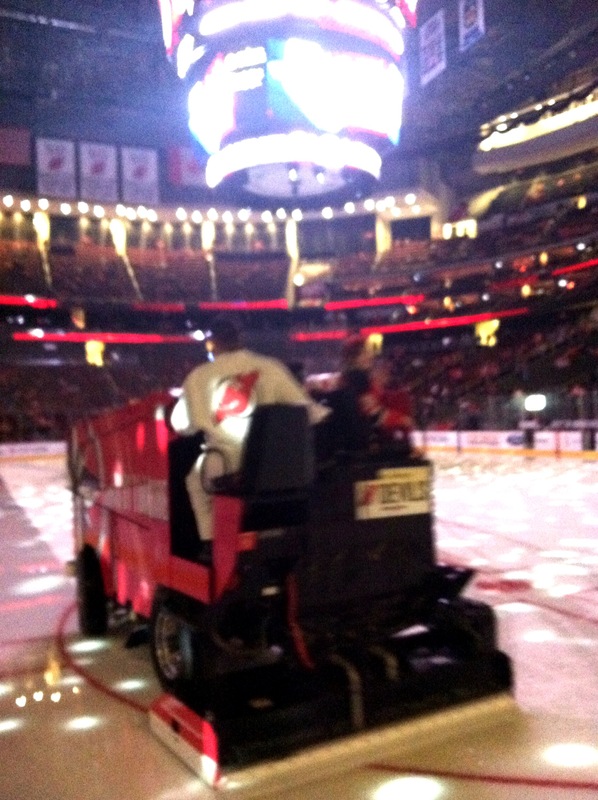 Riley goes for a ride around the Prudential Center ice. Not bad. Not bad at all. Lots of time spent together, and once again, hockey was the glue. We began with a Devils game Friday night. As part of our season-ticket package, we had the opportunity to choose from among several “experience” benefits. We ended up with a Zamboni ride. There was just one catch: only one child could ride. Riley was quick to point out that Ryan had already had a Zamboni ride, several years ago in Boston, and insisted it was only fair that she get to go this time. I looked at Ryan for signs of protest, but he offered only a mild objection. He was satisfied with the deal offered: If he would allow Riley to ride, he could eat dinner of pizza at the arena. He agreed, putting our weekend off to a good start. Riley and I checked in at the customer service area and signed all the necessary waivers. They offered her the choice to ride after pregame warmups or between periods. She initially preferred between periods, so she could ride and wave in front of full stands. But when the representative told her if she went after warmups we would be able to stand at the glass and watch the team up close, her mind was made up. 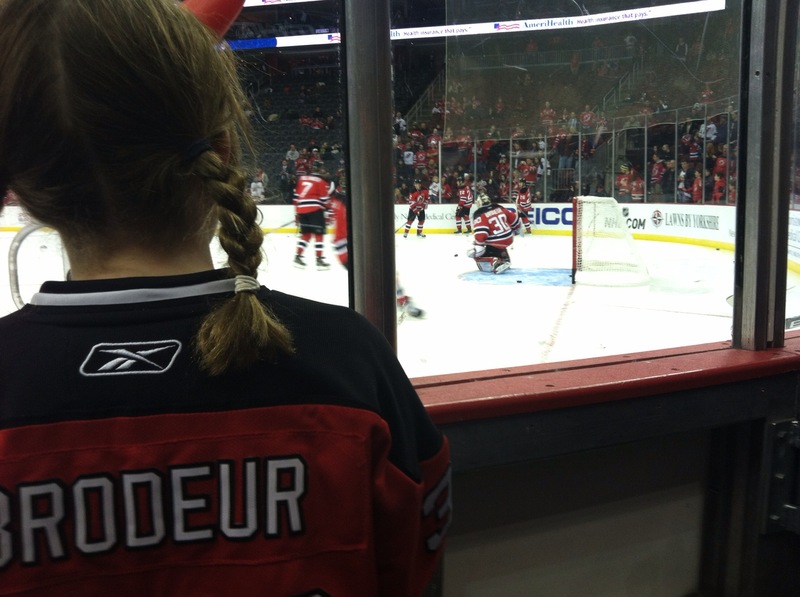 Riley has loved the Devils’ goalie, Martin Brodeur, since her first game as a three-year-old. When we had the chance to skate on the arena ice a few years ago, she actually sat down in his goal crease and had me take a picture just so she could be closer to her hero. Down by the ice, she oohed and ahhed as she watched Marty warm up from just a few feet away. 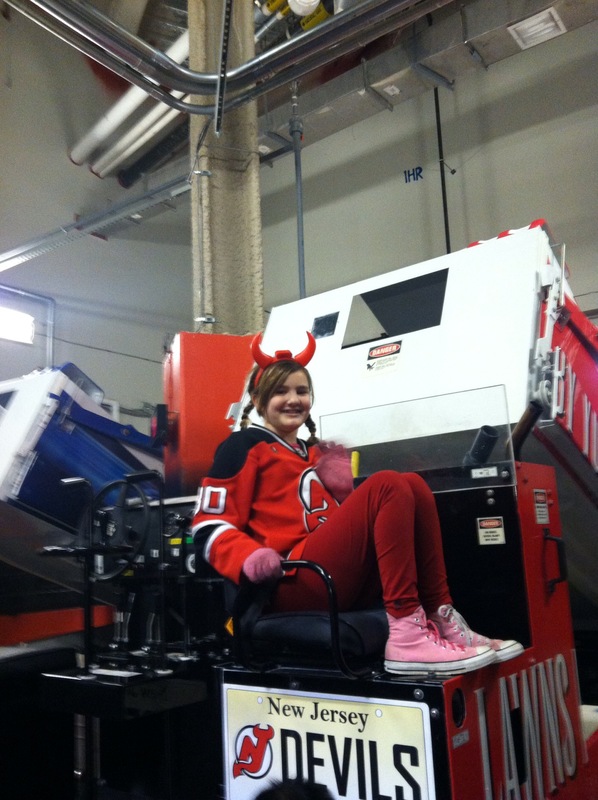 Soon it was time to climb onto the Zamboni for her big ride around the ice. The driver was incredibly sweet, showing her where to step as she climbed up. Soon, she was charming him with her knowledge of the Devils. The ride behind her, there was still a game to watch. It ended in thrilling fashion, with New Jersey winning in the final seconds. 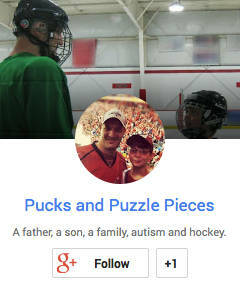 With it not being a school night, Ryan’s anxiety was greatly reduced — another win. 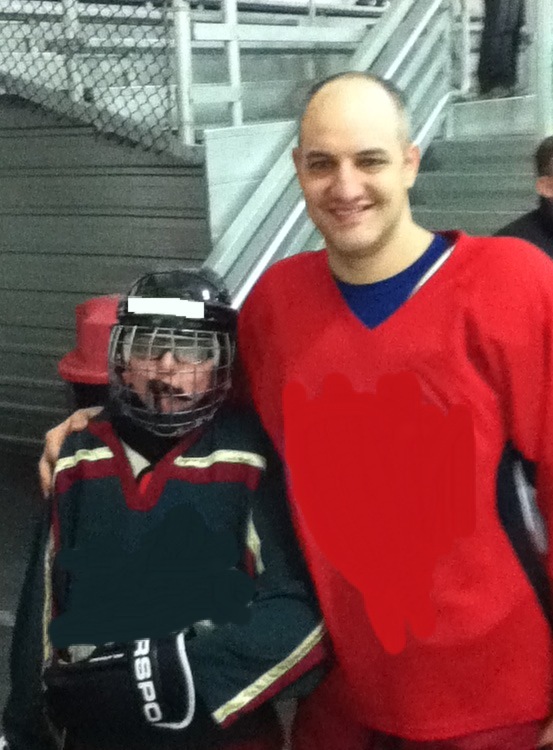 Saturday brought morning hockey practice for Ryan, followed by an uplifting progress report at his social skills group. Ryan willingly did his homework in the waiting room during our appointment, an unusually low maintenance, and practical, solution to his having to wait. The real highlight of Saturday for Ryan was the chance to watch his San Jose Sharks on television. They were playing an afternoon game on the west coast, meaning a reasonable start time for us in the east. Ryan planned his entire day around watching the game, which proved to be a wise decision when the Sharks cruised to an easy win to go to 4-0 on the year. Ryan’s favorite player, Joe Thornton, even scored a goal. Sunday would bring yet another hockey treat. Instead of a typical early morning game, Ryan’s team was scheduled to play at 8 p.m. Due to a quirk of scheduling, next up on the ice after his game was my adult league team, which was playing in our championship game. I packed our equipment bags in the car together and joked to Ryan that I might just suit up early and join his team on the ice. I can’t tell you what a thrill it was to stand at the glass, in full uniform, watching my son play while getting ready to go on myself. Ryan picked up an assist on a third-period goal that put the game out of reach for his team, and we exchanged high-fives as he came off the ice. It wasn’t quite as good as the time we actually got to play together, but it was close. The night ended with a league championship for my team. After Ryan was in bed, the Sharks won again to improve to 5-0. As hockey weekends go, this was pretty close to perfect. Oh sure, there were less-than-perfect moments in between, but aren’t there always? I’ll take my weekends like this 100 times out of 100. Love it!!!!!!! 🙂 Thank you for sharing! That does sound like a great weekend! We watched the Devils game that night (recorded) My NJ husband really misses being able to go to the games!